It’s a day all about relieving stress, where you’re encouraged to wear slippers to the office in an effort to boost morale. You may even decide to wear a poncho, or a red hat with bright orange socks. Whatever outfit you decide, it won’t matter. You will be letting the world know you’re taking part in Lifeline’s fourth annual Stress Down Day on Friday 22nd July. Lifeline spokesman Brendan Maher said stress was a growing community issue needed more awareness. “We get literally thousands of mainly workplaces but schools also participating and while it is about having fun and taking a day off stress, there is also a serious side to it,” he said. The serious side are the social, economic and health impacts individuals experience when dealing with stress. “It’s a throw away line – “I’m stressed” – but what does that mean? what can I do about it? “A little stress is fine, it keeps us motivated, it’s when it becomes prolonged, it can kill us. Mr Maher said people under stress might smoke or drink more often, turn to drugs or experience moodiness, which is why it was important everyone understood stress better. “The most important thing from our perspective, it’s about stress management and awareness, using the day to stop and think about stress,” he said. Manager of Bayside Family Daycare Linda Harnett said it was easy to become stressed – her workload had doubled in size during the past few years. To manage stress she works on jobs requiring extended focus until after business hours. The problem facing the community was not awareness but understanding stress. “I think there is a lot of awareness about stress, I’m not sure that people link real stress with real problems,” Ms Harnett said. Funds raised from Stress Down Day go towards running Lifeline’s 24-hour crisis-line which provided help to almost 450,000 callers last year. 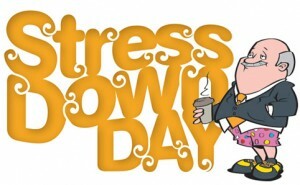 Businesses and individuals have raised more than $7,000 for Stress Down Day this year and in doing so would be less stressed, if only for a day. For more information see Lifeline’s stress down website, www.stressdown.org.au.